SMEs are thought to be the most dynamic firms when it comes to catalyzing economies. Organization for Economic Cooperation and Development defines SMEs as Small and Medium-sized Enterprises (SMEs) that are non-subsidiary, independent, and employ less than a given number of employees which varies across countries (Observer, 2000). They are believed to be the economic pillars for growth and development leading to positive socio-economic performance. They are exemplary in terms of performance through innovative practices and use of new technologies (Shackelford & Sun, 2009) with great capabilities to create employment and wealth when performing well (Sandberg, 2003). Globalization has increased the market complexity and uncertainty, has intensified the need to be more responsive and has encouraged employee mobility. The characteristics of globalization are causing rapid changes globally within organizational environments and so are posing excessive challenges to organizations with regards to competitiveness and sustainable growth. Those challenges are undoubtedly more impactful on SMEs and they seem to keep mounting through economic issues such as difficulties in securing initial capital, accessibility to resources and access to new technologies for innovation (Günter Verheugen, 2005). Globalization has also progressively intensified competition making safe-keeping of acquired knowledge and adoption of innovative practices with appropriate business strategy to improve the competitiveness unavoidable. As a result, effective strategies for managing key valuable organizational assets are undoubtedly crucial to enhance performance. It is the ultimate goal of every organization regardless of size to continue to perform, grow and progress so to ensure return on investments of shareholders (Pirnea & Caldararu, 2012) and it is no exception for SMEs. But due to continuous shift towards globalization as highlighted above, markets keep becoming more complex and instable and organizations are experiencing record high employee turnover while facing increasingly demanding customers (Becerra-Fernandez & Sabherwal, 2014). Consequently, for many entrepreneurial organizations including SMEs, survival is becoming more of the goal rather than growth threatening economic progress. This should be viewed as a significant economic threat and therefore appropriate solutions need to be identified and implemented. Understanding the current entrepreneurial economy is always a sensible starting point to better prepare organizations to be more responsive. The current economy is often referred to as the knowledge- based economy as currently economic productions and services are mainly based on knowledge-intensive activities (Powell & Snellman, 2004). Powell & Snellman (2004), further explained that in this knowledge-based economy, technical and scientific advancement may be accelerated which is the current scenario in SMEs but simultaneously they can also become obsolete much quicker. As a result, organizations end up with shorter resources value span thus requiring them to be even faster in decision making and more responsive in terms of offering new product and services. Keeping up with accelerated technical and scientific advancement investments that are becoming obsolete quicker is also becoming a hindrance for SMEs growth and progress. It is argued that many determinants may influence organizational performance operating within this current economy and one that is being increasingly recognized as essential is knowledge management (Liao & Wu, 2009). Knowledge management is emphasized upon as one of the key influential factors with regards to organizational performance. It is the process of reforming tacit to explicit knowledge, which is one of the most valuable assets of any organization. It enables efficient and well-organized information, dynamic learning, decision-making and strategic design. Furthermore, it raises organizational awareness of individual and shared knowledge which is also one of the goals of knowledge management (Saqib et al., 2017). Knowledge is considered as strategic organizational assets which plays a crucial role towards the survival and sustainability of organizations within this competitive business environment (Skyrme, 2012). Therefore, to effectively respond to the ever-changing market needs, knowledge and the management of knowledge are becoming necessities to any organization regardless of its size even though the managing approach could be different (Rizea et al., 2011). Previous research studies have identified various constrains and barriers to knowledge management effect on organizational performance such as limited technical and managerial expertise (Freel, 2000; Shi et al., 2008; Racol?a-Paina & Burc?-Voicu, 2013; Chaochotechuang et al., 2015), inadequate infrastructure and limited knowledge of environmental aspects (Hashim & Wafa, 2002; Ayoob & Balabrishnan, 2012), and negligence to innovation and limited resources to adopt and implement technology (Kharuddin et al., 2010). Despite of the constrains and barriers, several research studies have confirm positive relationship between knowledge management and organizational performance (Egbu et al., 2005; Sabri, 2005; Daud et al., 2008, Zaied et al., 2012). However, most of those studies focused on larger organizations with few focusing on smaller enterprises (Rizea et al., 2011). Furthermore, the limited focus on smaller enterprises concentrated to other parts of the world (Zack et al., 2009) and not much on Middle East countries such as Oman. Also, interest has been generated with regards to moderators between knowledge management and organizational performance such as organizational learning (Liao & Wu, 2009) and so should be technology due to its rapid advancement. This study intends to start shedding some lights on those under-represented areas relating knowledge management and organizational performance. So the focus is on Oman, a Middle East country, the knowledge management and organizational performance relationship in its manufacturing SMEs and the moderating effect of technology. Therefore, the research study can be viewed as an empirical investigation of the moderating effect of technology orientation among the relationship of knowledge management and performance of organizations. It uses a unified-multidimensional research-framework by integrating two diverse literature streams of Business Intelligence-Analytics (BI&A) and analyzes their mutual association on the impact of organizational performance. It provides empirical analysis, findings and recommendations to entrepreneurs, managers and practitioners. It also provides significant and pioneer contribution to the current research study of BI&A technologies and performance of organizations with associated moderating effect of technology in the perspective of Oman. KM is defined in a variety of ways. Some include making effective use of available knowledge resources within organizations by transforming individual knowledge into organizational knowledge (Rasula et al., 2012), systematic process of acquisition, creation, refinement, storage, transfer, sharing, and utilization of knowledge to improve employees’ understanding (King, 2009), bringing employees together to promote innovative collaboration and be more productive from an individual and collective standpoint (Dalkir, 2013), or a quick and efficient way to managing intellectual property (Hamzehi & Khodayari, 2016). It is simply doing what is needed to get the most out of knowledge resources and making important knowledge available wherever and whenever it is needed across organizations. Consequently, continue to expand employees’ productive capabilities and their potential contributions leading to better organizational memory, quicker problem solving capabilities, more innovative, better knowledge embedded products and services, more competitive and stronger drive to the overall organizational strategies (Dalkir, 2013). SMEs strive on their know-how making their knowledge assets invaluable in terms of getting insights on the best possible strategies to achieve set targets. Their successes relate to properly managing their knowledge (Dollinger, 1984:1985; Brush & Vanderwerf, 1992) which serves as a powerful element within the process or product development (Davenport & Prusak, 1998). It has been noted that the absence of knowledge culture and marketing skills are key causes of poor performance of SMEs with many failing due to negligence and inadequate Knowledge Management (KM) practice (Egbu et al., 2005; Sabri, 2005; Daud et al., 2008). Therefore, it needs to be emphasized that KM has become an important driving force for achieving organizational aims and economic objectives. Furthermore, empirical research studies by Cerchione et al., 2015 showed that the use of KM practices can contribute to the overall growth of SMEs by simultaneously and significantly enhancing their performances. Other key issues faced by SMEs are getting enough funding from banks and other financial institutions, the availability of long term loans with favorable interest rates, the collateral requirements and formalities, and the lack of innovations and training (Murthy, 2009; Belwal et al., 2014; Atef & Al-Balushi, 2015; Bilal & Al Mqbali, 2015). Excessive bureaucracy and transportation cost also play a major role (McWilliam, 2011; Thorpe et al., 2005). The table below shows the percentage share of SMEs in employment, in GDP and no of companies. Source: Analytics SME Monitoring Report (2015). SMEs have to grow and progress to ensure the expected returns on investment and such can be achieved through sustainable superior organizational performance. Many determinants have been identified as influential to organizational performance with few becoming increasingly vital such as knowledge management, innovation and emerging technologies adoption and application (Nawab et al., 2015) which are part of the focus of the paper. Technology use in workplaces enables the workforce to share resources and communicate efficiently and effectively to encourage innovative ideas. Berisha-Namani (2009), states that in the current scenario, use of technology can provide flexibility, better interaction and interconnectivity with partners, customers, suppliers and the market both at national and international levels. It is becoming even more so as societies are now moving from an information society to a high value information or “knowledge society”. Many organizations have spent substantial amount on the development of technology infrastructure while technology orientation within SMEs is still not as common as compared to large and international enterprises. Ashrafi & Murtaza, 2008:2013; Ashrafi et al., 2014, reported that one of the main barriers in technology adoption is lack of awareness resulting in too many countries spending more on technological solutions and awareness programs in order to gain benefits. SMEs have been fairly slow in taking up technology adoption (Jutla et al., 2002; Lawson et al., 2003; Lopez-Nicolas & Soto-Acosta, 2010). Acknowledging the fact that knowledge management concept is described in several inconsistent ways, in this paper where SMEs performance is the main concern, KM is referred to as the dynamic combination of three specific measurable components namely Knowledge Identification & Acquisition, Knowledge Dissemination and Knowledge Application which when they are appropriately used, will result in enhanced organizational performance (Saqib et al., 2017; Abdullah, 1999; Asoh & Belardo, 2007; Zhou & Uhlaner, 2009). Durst & Runar Edvardsson (2012) in a research study on SMEs realized that though there is some awareness in SMEs on KM, it is not holistically approached. Certain areas of knowledge management like dissemination and implementation are strong whereas the areas of knowledge identification, storage and usage lack adequate understanding, and suggested more research to look at the growth of SMEs from that angle. As per the well-known architecture of KM comprising of people or culture, process and technology, technology is considered a major enabler and vital to KM implementation. Several research scholars suggested that Technology Orientation (TO) is valuable to SMEs. In this paper, its potential effects as moderating role on the relationship between knowledge management and performance of SMEs are explored. Few studies that attempt to create association between them lack empirical and consistent evidence and therefore, a more theoretical and empirical approach is being used to investigate the proposed relationship between knowledge management, technology orientation and SMEs performance. This study aims to use an important and most suitable method called as survey method. Agreeing to Zikmund survey technique (Zikmund et al., 2013), it is more functional in exploring and development of an idea and also in trying to find the explanations of any specific accomplishment. The method is well-liked and is very frequently used for conducting quantitative research in the field of management sciences (Bennett, 2003). Thus, based on the literature facts discussed above, it is determined that survey methodology would be suitable for our research. For better sampling, it is very important to take a note of heterogeneity factor in the target population, variables of research and proposed statistical for the data analysis as stated by (Johnson, 2001; Hussey & Hussey, 1997). Keeping in view the above mentioned considerations, a sample size is calculated based on the table provided by Krejcie & Morgan (1970). Manufacturing SMEs, Sultanate of Oman were segregated/stratified on the basis of “number of SMEs”. This study has used “proportionate stratified random sampling” technique to select the sample. Proportionate sampling is suitable as when it is “easier, simpler, and less expensive” to collect data from one or more stratum (Krejcie & Morgan, 1970; Sekaran & Bougie, 2016). The sample was randomly selected according to the population size in each stratum, that is, city in Sultanate of Oman. Currently, there are three major cities with maximum number of manufacturing industries, that is, Muscat, Sohar and Nizwa. Accordingly sample was collected as shown below. Note: By applying Stratified proportionate Random Sampling. In conducting a quantitative research, one of the important considerations is hypotheses development. Following (Noble & Kumar, 2010), hypothesis is defined as “a proposition that is stated in a testable form and that predicts a particular relationship between two (or more) variables”. The present research study proposed that there is positive relationship between knowledge management and performance of SME in terms of the KM practices that organizations are practicing. The above mentioned hypothesis postulates the relationship between the dimensions (processes) of knowledge management and SMEs performance measures. This means that the SMEs performance improves when the degree of knowledge management processes are practiced. Consequently, in order to investigate the degree of relationship between KM and SMEs Performance, following relationship is hypothesized. H1: There is a positive relationship between Knowledge Management and Performance of SMEs. H2: There is a positive relationship between Technology Orientation and Performance of SMEs. Baron & Kenny (1986), and Johnson (2013) posited that in the such cases where relationships between the independent, the predictor variable and dependent, outcome variables are not fully established as significant or insignificant, consistent or inconsistent, in those situations, it is recommended to apply moderator variable to assess its association on the aforementioned relationships. H3: Technology Orientation moderates the relationship between Knowledge Management and Performance of SMEs. The result analysis starts with the presentations of how the individual components of the conceptual framework (Figure 1) were measured, followed by the interpretations of their inter-relationships resulted from the analysis of the collected data. The contributing elements refer to the three main components showed in the conceptual diagram namely Knowledge Management, Technology Orientation and SMEs Performance. The contributions of knowledge management within the SMEs in Oman are defined by three sub categories namely knowledge identification & acquisition, knowledge storage & dissemination and knowledge application & creation. Knowledge identification & acquisition relates to elements such as the extent to which new knowledge is achieved through internal and external source tacitly or explicitly, how much of such knowledge is converted into useful forms for further product development, and the enhancing of existing knowledge through the recruitment process. Knowledge identification & acquisition is given an average rating of 3.38 out of 5 showing that manufacturing SMEs in Oman do pay attention to identifying and acquiring new knowledge to further enhance their manufacturing capabilities. Besides the existing workforce, it also shows they integrate the same within their recruitment process to ensure that some sort of knowledge value adding results from the process. Knowledge storage & dissemination relates to elements such as the extent gained knowledge is properly organized and stored through the use of organizational formal repositories. In other words, converting individualized knowledge into organizational knowledge which can easily be accessed or shared to appropriate targeted colleagues using different means and mechanisms. It further promotes the knowledge sharing culture which mitigates knowledge gaps within organizations due to employee mobility. Knowledge storage & dissemination is given an average rating of 3.53 out of 5 which shows that manufacturing SMEs in Oman do invest effort in building organizational knowledge by converting individualized knowledge to systemic knowledge which later become accessible to appropriate work groups positively impacting the efficiency and effectiveness of the SMEs. Knowledge application & creation relates to elements such as the extent to which policies and procedures are adhered to so as to protect organizational knowledge while promoting its application to enhance the operational capabilities of individuals, organizations and communities. It also looks at the extent to which feedbacks received from experts are integrated within current practices to improve development processes and product development to further drive the competitive edge. Furthermore, how actively and strategically knowledge creation is incentivized and managed while simultaneously instilling the appreciation in employees that knowledge created while undertaking organizational activities is part of organizational assets. Knowledge application & creation is given an average rating of 3.97 out of 5 which shows that manufacturing SMEs in Oman do emphasize on the adherence to policies and procedures developed through the incorporation of good practices and expert opinions. This ensures that knowledge is well managed and applied during process development and product development. The analysis gives an average rating of 3.62 out of 5 for knowledge management in general showing that the practice is fairly well embraced by manufacturing SMEs in Oman. The contributions of technology within the SMEs in Oman are defined by two sub categories namely technology development awareness and technology pro-activeness. Technology development awareness relates to elements such as the extent sophisticated technologies are integrated and used across operational units to ensure state of the art product development to keep ahead of competitors. Technology development awareness is given an average rating of 3.88 out of 5 which shows that manufacturing SMEs in Oman well integrate and use sophisticated technologies across their operational units to ensure high quality product development thus being market competitive. Technology pro-activeness relates to elements such as the extent to which organizations emphasize on R&D with regards to ambitiously creating technical knowledge among individuals and across the organization to develop and maintain better industrial and manufacturing techniques than that of competitors. It also involves the extent to which organizations build relationships with technology suppliers that can lead to customized equipment creating the desirable competitive advantage while at the same time, pro-actively working on internal technology developments and marketing successes which can also provide competitive advantage with regards to industrial standing. Technology pro-activeness is given an average rating of 4.02 out of 5 which shows that manufacturing SMEs in Oman are doing very well in terms of R&D (internal and external) to enhance individual and organizational knowledge relating to keeping up with the development of better industrial and manufacturing techniques and also creating appropriate alliances with suppliers to achieve competitive advantages through the use of customized equipment. The analysis gives an average rating of 3.95 out of 5 for technology orientation in general showing that technologies are even better embraced than knowledge management practice by manufacturing SMEs in Oman. Performance is the dependent component of the conceptual framework and it is based on three sub categories (action strategies) resulting from the knowledge management practice and technology orientation namely sales and marketing, product development and resource planning. Sales and marketing relates to elements such as the extent to which organizations know their market and how it is helping them with their market development strategy and gaining shares, and improving their sales growth rate. Sales and marketing is given an average rating of 4.11 out of 5 which shows that manufacturing SMEs in Oman have a very good understanding of the market they are operating within and that is helping them in developing their marketing strategies and expanding their market share. Product development relates to elements such as the extent to which organizations continuously undertake research activities that result in innovative product development. Product development is given an average rating of 4.15 out of 5 which shows that manufacturing SMEs in Oman are continuously finding ways through research activities to be more innovative when it comes to product development. Resource planning relates to elements such as the extent to which organizations appropriately invest in organizational resources be it human resources or not, to optimize operating benefits thus return on investment. Resource planning is given an average rating of 4.18 out of 5 which shows that manufacturing SMEs in Oman appropriately invest in resources required to achieve optimal operating performance to ensure return on investment. The analysis gives an average rating of 4.15 out of 5 for performance in general showing that manufacturing SMEs in Oman feel that they are achieving very good performance. It can be noted that knowledge identification & acquisition, knowledge storage & dissemination and knowledge application & creation are fairly well practiced within the manufacturing SMEs in Oman with individual practice level of 0.678, 0.659 and 0.621 respectively. They significantly influence the knowledge management practice within the manufacturing SMEs in Oman with correlating values of 0.897, 0.937 and 0.870 respectively. Yet still, the overall measurement for knowledge management practice within the manufacturing SMEs in Oman is only 0.531 showing that knowledge management practice is still fairly limited. The components of knowledge management seemed to be operating as isolated activities rather than together as a process. Consequentially, the level of knowledge management being practiced within the manufacturing SMEs in Oman is having minimal influence on the organizational performance with a correlating value of only 0.074. But interestingly, the intervention of technology as a moderating variable which is also fairly well practiced with a level of 0.614 within the manufacturing SMEs improves the influencing factor significantly with a correlating value of 0.762 making a reasonable organizational performance of 0.638 achievable. It would seem that currently the perceptions are fragmented (Durst & Runar Edvardsson, 2012) but if the components of knowledge management could be better combined into synchronized processes within the manufacturing SMEs in Oman, better correlating values between knowledge management and organizational performance could be achieved thus further improvement in overall organizational performance. At present, the moderating variable which is technology is playing a crucial role on the overall organizational performance as shown on the moderating effect graph below. This works well for the manufacturing SMEs in Oman due to the high penetration of technology within that industry (Ashrafi & Murtaza, 2013). From the graph, it can be clearly noted that the growth in the overall organizational performance increases at a greater rate as the intervention of technology increases. The empirical finding in this study established that technology orientation affects the relationship between knowledge management and SMEs performance. 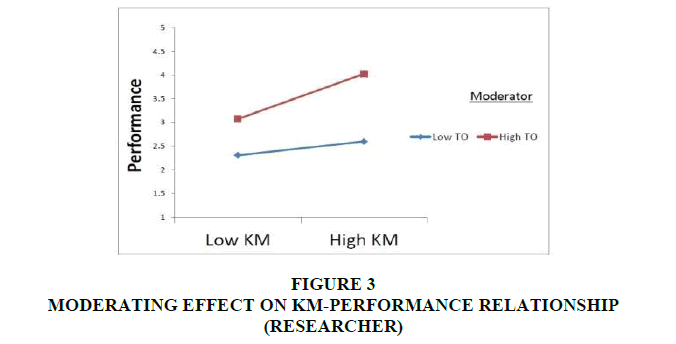 This finding suggests that the effect of technology orientation is stronger on the relationship of knowledge management and organizational performance and provide theoretical and empirical support for the moderating role of technology orientation on that relationship with respect to SMEs performance. The findings are in line with finding by Chen et al. (2014) which suggest that technological capability plays significant role in the pursuit of product/service performance. Therefore, organizations should be more technology oriented in such way that organizational knowledge is prioritized and developed to achieve more manufacturing activities that are highly integrated, and that can sustain greater competitive advantages. This study provides additional contribution to the body of knowledge on the moderating effects of technology orientation on the relationship between knowledge management, and SMEs performance. The findings have provided empirical support to all of the research questions formulated despite few limitations. As for the three hypothesis statements highlighted earlier in this study, all three hypotheses (two direct and one moderating effect) were statistically significant. While there have been several studies that examined several underlying factors influencing organizational performance among manufacturing SMEs, this study has addressed a theoretical gap by incorporating technology orientation as a significant moderating variable. 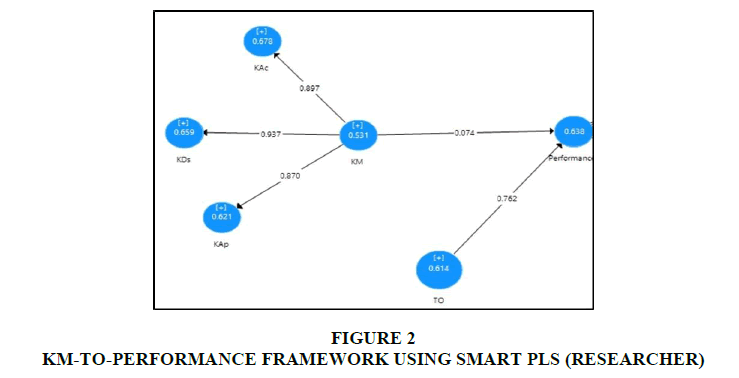 The framework developed in this study has contributed to the domain of the theory of growth of organization and resource-based view theory, and by extension, to the fields of knowledge- based view and dynamic capabilities perspective, by examining the influence of knowledge management and technology orientation on SMEs performance. The notion of this research is that knowledge management and technology have an impact on the performance of entrepreneurial organizations within this emerging knowledge-economy era. Many organizations depend upon knowledge and have untied the research prospects to fill the existing gaps. To promote knowledge management within SMEs in Oman to the extent that it can provide that expected positive thrust to their performances, a number of activities have been identified as possible catalyst. The first one being the developing of capability for or supporting research & development in SMEs sector, the second being the promoting of collaboration among SMEs, the third being the reviewing of Government legislation and support towards the SMEs, the fourth being having a well-focused capacity building plan (Human Resource Development Plan), and finally being the striving for a more competitive market. Many barriers to adopt emerging technologies and factors that are associated to limited adopted technology in SMEs firms. The challenge thus lies in dealing with the implications of technology within organizations, the effects of which may lead to a positive change in the organization. Technology orientation may further solve the impending problems, reduced cost and strengthen the overall performance as also shown in the above stated empirical research. Consequently, it will ensure better understanding of the business environments, save time-to-markets (reduce product/process development life cycle time), promote learning and enhance problem solving skills, and encourage integration of new knowledge to stimulate creative products and services. Consistent with these findings, policy makers need to emphasize more on knowledge and technology as important resources in the manufacturing strategy processes and manufacturing performance. Recommendation section highlights a number of activities that can be considered to encourage such practices. Innovation relates to application/transmission of knowledge from research to development of products/services. Innovative organizations are strongly Research & Development (R&D) oriented and are proactive in acquiring novel information while using sophisticated technologies (Banker et al., 1984; Kanter, 1988). Little emphasis is currently being placed on R&D in manufacturing SMEs neither to acquire novel knowledge nor to embrace the continuous development of good practices within the sector. This is mainly due to limited research capabilities and the culture of non-research based decision making. Building research capabilities of SMEs, entrepreneurships and changing the culture regarding research is an effective means for a long term solution as it would require significant time and effort while a more immediate solution is to develop a working relationship between the SMEs sector and the bodies/authorities that already have the research capabilities. For instance, the Oman Research Council which is a Government affiliated body can work alongside the SMEs to undertake the more pressing research needs while simultaneously providing some guidance to them on how to integrate basic research and innovation within their current practices. The outcomes of the researches can then be made accessible to all SMEs to promote good practices which can in turn boost their performances and growth. Collaborative innovation is becoming increasingly important as it promotes the knowledge sharing culture which normally leads to good practices thus resulting in overall performance enhancement. Currently, minimal or no collaboration is formally being practiced in between SMEs and therefore diffusion of good practices and newly created knowledge through the SME sector is very limited (Varum & Rocha, 2012). A knowledge management initiative supported by technology where good practices may be exchanged or shared among SMEs and new knowledge may be generated would be helpful. Such initiatives are becoming very common in SMEs sector and proven to be very successful in countries such as Thailand, Bangladesh, Pakistan, China, Singapore, and Malaysia and so on. Capabilities and resources required to implement such initiative are likely to be beyond the SMEs in Oman and therefore the support will have to come from the Government which is also well positioned to incentivize the SMEs to participate. Challenges faced by most developing countries’ SMEs have restricted access to top quality raw materials and lack of experienced human resource to take advantage of information and communication technologies for business practice improvements and entrepreneurial activities (Mutula & Van Brakel, 2006). The absence of knowledge management and innovation culture, insufficient marketing and managerial skills, and difficulty in accessing easy financing are add on challenges (Qiang et al., 2006; Qiu Zhang & Morrison, 2007). Furthermore, SMEs in developing countries tend to have lesser market shares due to their less than ideal infrastructure and their struggles to integrate regional cooperation, governance, legal and administrative processes. (Ongori, 2008). Oman being a developing country, its SMEs are facing similar issues and therefore further commitment and support is required from the Government. Improved or new trade deals have to be put in place that would allow SMEs to have easy access to and affordable importation of high quality raw materials. This should be accompanied by accessible favorable financing to ensure that SMEs could actually make use of the deals. As a result, the quality of the products being produced by SMEs could be greatly enhanced thus becoming more marketable beyond the Omani border. With the right marketing strategies through the same trade deals, the potential export market size and reach could significantly increase and so would be the growth of the SMEs sector. As explained by the Central Bank of Oman, reduction in rigidities and some push in the manufacturing sector could improve competitiveness and performances in the Sultanate (CBO, 2016). Currently, market trends or behaviors especially in SMEs tend to be quite stagnant as there is not much of a competition within the Oman market (Al-Shanfari, 2012). SMEs are operating quite comfortably and safely within the Omani market to the extent where the need to grow and enhance the quality of existing products/services or even consider developing new ones does not come high on their agenda. But as discussed earlier, SMEs have a major dynamic role to play within a developing economy and it should be the same case for Oman where the SMEs sector is pretty static (CBO, 2016). Therefore, the need to push for a more competitive market should get the SMEs to become more active regarding the economic development. This study has been able to provide support for the hypothesized paths between the predictors and the criterion variable; however, the results also consider some limitations of the study. Firstly, this study was carried out using a cross-sectional survey design to collect data at a single-point-in-time preventing causal inferences to be made from the population of the study. Therefore, it is suggested that an alternative research design, like longitudinal design, should be considered in future studies as it will allow the latent construct’s measurement at different points in time in order to acquire more understanding of this study’s model. Secondly, the present study was conducted among Omani small and medium scale manufacturing firms only. As a result, it offers limited generalizability. Although, studies have noted that knowledge management implementing SMEs are known to perform better in several processes like return on investment, customers satisfaction, employee development, and market share and development (Anantatmula & Kanungo, 2006), it should be noted that SMEs are constrained by their size and resource inadequacy unlike larger firms (Sullivan et al., 2012). However, other previous studies have revealed that technology-oriented SME firms are usually characterized by improved performance in areas like R&D activities which strengthens their technological base. Future studies should be longitudinal to assist in understanding the trend of knowledge management practices in manufacturing SMEs including the adoption of related technologies. It should also be extended to include larger manufacturing firms that have shown to be more responsive to knowledge management, quicker innovators and more technology-oriented in their organization’s overall mission than their smaller SME counterparts (Brett et al., 2017; Byukusenge & Munene, 2017). Given the huge variation of sizes and resources within the so-called SMEs, creation of sub-categories of SMEs should be considered as it may provide results that are more indicative of manufacturing SMEs (classified SMEs). Also extending the study to different areas of SMEs together with the created categories can also provide a better sense of generalization of knowledge management practices in SMEs. Abdullah, M.A. (1999). The accessibility of the government-sponsored support programmes for small and medium-sized enterprises in Penang. Cities, 16(2), 83-92. Al-Shanfari, D.A. (2012). Entrepreneurship in Oman: A snapshot of the main challenges. In Proceedings of the United Nations Conference on Trade and Development: Multi-year expert meeting on enterprise development policies and capacity-building in science, technology and innovation (STI). Anantatmula, V., & Kanungo, S. (2006). Structuring the underlying relations among the knowledge management outcomes. Journal of Knowledge Management, 10(4), 25-42. Ashrafi, R., & Murtaza, M. (2008). Use and impact of ICT on SMEs in Oman. Electronic Journal of Information Systems Evaluation, 11(3). Ashrafi, R., & Murtaza, M. (2013). ICT adoption in SME in an Arab GCC country: Oman. Small and Medium Enterprises: Concepts, Methodologies, Tools, and Applications. Ashrafi, R., Sharma, S.K., Al-Badi, A.H., & Al-Gharbi, K. (2014). Achieving business success through information and communication technologies adoption by small and medium enterprises in Oman. Middle-East Journal of Scientific Research, 22(1), 138-146. Asoh, D.A., & Belardo, S. (2007). Assessing knowledge management: Refining and cross validating the knowledge management index using structural equation modeling techniques. International Journal of Knowledge Management, 3(2), 1-30. Atef, T.M., & Al-Balushi, M. (2015). Entrepreneurship as a means for restructuring employment patterns. Tourism and Hospitality Research, 15(2), 73-90. Ayoob, C., & Balakrishnan, S. (2012). SMEs in Sultanate of Oman: Meeting the development challenges. Research Journal of Economics and Business Studies, 1(9), 27-30. Banker, R.D., Charnes, A., & Cooper, W.W. (1984). Some models for estimating technical and scale inefficiencies in data envelopment analysis. Management Science, 30(9), 1078-1092. Baron, R.M., & Kenny, D.A. (1986). The moderator–mediator variable distinction in social psychological research: Conceptual, strategic, and statistical considerations. Journal of Personality and Social Psychology, 51(6), 1173. Becerra-Fernandez, I., & Sabherwal, R. (2014). Knowledge management: Systems and processes. Routledge. Belwal, S., Belwal, R., & Saidi, F.A. (2014). Characteristics, motivations, and challenges of women entrepreneurs in Oman’s Al-Dhahira Region. Journal of Middle East Women’s Studies, 10(2), 135-151. Bennett, R. (2003). Factors underlying the inclination to donate to particular types of charity. International Journal of Nonprofit and Voluntary Sector Marketing, 8(1), 12-29. Berisha-Namani, M. (2009, March). The role of information technology in small and medium sized enterprises in Kosova. Fulbright Academy Conference. Bilal, Z.O., & Al Mqbali, N.S. (2015). Challenges and constrains faced by small and medium enterprises (SMEs) in Al Batinah governorate of Oman. World Journal of Entrepreneurship, Management and Sustainable Development, 11(2), 120-130. Bosua, R., & Venkitachalam, K. (2013). Aligning strategies and processes in knowledge management: A framework. Journal of Knowledge Management, 17(3), 331-346. Brett, V., O’Gorman, B., & Afonso, Ó. (2017). Supporting knowledge and policy-based stakeholders in delivering regional impact: A tool to select regional scoreboard indicators. The Quadruple Innovation Helix Nexus. Palgrave Macmillan, New York. Brush, C.G., & Vanderwerf, P.A. (1992). A comparison of methods and sources for obtaining estimates of new venture performance. Journal of Business Venturing, 7(2), 157-170. Byukusenge, E., & Munene, J.C. (2017). Knowledge management and business performance: Does innovation matter? Cogent Business & Management, 4(1), 1368434. CBO (2016). Annual report of Oman. Muscat: Central Bank of Oman. Cerchione, R., Esposito, E., & Spadaro, M.R. (2015). The spread of knowledge management in SMEs: A scenario in evolution. Sustainability, 7(8), 10210-10232. Chaochotechuang, P., Daneshgar, F., & Sindakis, S. (2015). Innovation strategies of new product development (NPD): Case of Thai small and medium-sized enterprises (SMEs). In The Entrepreneurial Rise in Southeast Asia (pp. 11-33). Palgrave Macmillan, New York. Chen, H.L., Hsu, W.T., & Chang, C.Y. (2014). Family ownership, institutional ownership, and internationalization of SMEs. Journal of Small Business Management, 52(4), 771-789. Collis, J., & Hussey, R. (2013). Business research: A practical guide for undergraduate and postgraduate students. Macmillan International Higher Education. Dalkir, K. (2013). Knowledge management in theory and practice. Routledge..
Daud, S., Rahim, R.E.A., & Alimun, R. (2008). Knowledge creation and innovation in classroom. International Journal of Human and Social Sciences, 3(1), 75-79. Davenport, T.H., & Prusak, L. (1998). Working knowledge: How organizations manage what they know. Harvard Business Press. Dollinger, M.J. (1984). Environmental boundary spanning and information processing effects on organizational performance. Academy of Management Journal, 27(2), 351-368. Dollinger, M.J. (1985). Environmental contacts and financial performance of the small firm. Journal of Small Business Management, 23(000001), 24. Dorf, R.C., Byers, T.H., & Nelson, A.J. (2008). Technology ventures: From idea to enterprise. McGraw-Hill Higher Education. Durst, S., & Runar Edvardsson, I. (2012). Knowledge management in SMEs: A literature review. Journal of Knowledge Management, 16(6), 879-903. Egbu, C.O., Hari, S., & Renukappa, S.H. (2005). Knowledge management for sustainable competitiveness in small and medium surveying practices. Structural Survey, 23(1), 7-21. Freel, M.S. (2000). Strategy and structure in innovative manufacturing SMEs: The case of an English region. Small Business Economics, 15(1), 27-45. Günter Verheugen, G. (2005). The new SME definition: User guide and model declaration. European Commission. Hamzehi, A., & Khodayari, M.A. (2016). The relationship between business intelligence and knowledge management dimensions. Account and Financial Management Journal, 1(05), 250-257. Hashim, M.K., & Wafa, S.A. (2002). Small & medium-sized enterprises in Malaysia: Development issues. Pearson Malaysia. Hussey, J., & Hussey, R. (1997). Business research. Johnson, B. (2001). Toward a new classification of non-experimental quantitative research. Educational Researcher, 30(2), 3-13. Johnson, R.D. (2013). Knowledge management according to organizational size: A South African perspective. South African Journal of Information Management, 15(1). Jutla, D., Bodorik, P., & Dhaliwal, J. (2002). Supporting the e-business readiness of small and medium-sized enterprises: approaches and metrics. Internet Research, 12(2), 139-164. Kanter, R.M. (1988). Three tiers for innovation research. Communication Research, 15(5), 509-523. Khairuddin, S., Ashhari, Z.M., & Nassir, A.M. (2010). Information system and firm's performance: The case of Malaysian small medium enterprise. Journal of International Business Research, 3(4), 28-35. King, W.R. (2009). Knowledge management and organizational learning. In Knowledge management and organizational learning (pp. 3-13). Springer, Boston, MA. Lawson, R., Alcock, C., Cooper, J., & Burgess, L. (2003). Factors affecting adoption of electronic commerce technologies by SMEs: An Australian study. Journal of Small Business and Enterprise Development, 10(3), 265-276. Liao, S.H., & Wu, C.C. (2009). The relationship among knowledge management, organizational learning, and organizational performance. International Journal of Business and Management, 4(4), 64. Lopez-Nicolas, C., & Soto-Acosta, P. (2010). Analyzing ICT adoption and use effects on knowledge creation: An empirical investigation in SMEs. International Journal of Information Management, 30(6), 521-528. McWilliam, T.P.E. (2011). Made in Oman: Promoting manufacturing and export in the sultanate of Oman. Murthy, Y.S.R. (2009). Managing small and medium enterprises in Oman and financing problems. i-Manager's Journal on Management, 4(2), 68. Mutula, S.M., & Van Brakel, P. (2006). E-readiness of SMEs in the ICT sector in Botswana with respect to information access. The Electronic Library, 24(3), 402-417. Nawab, S., Nazir, T., Zahid, M.M., & Fawad, S.M. (2015). Knowledge management, innovation and organizational performance. International Journal of Knowledge Engineering-IACSIT, 1(1), 43-48. Noble, C.H., & Kumar, M. (2010). Exploring the appeal of product design: A grounded, value?based model of key design elements and relationships. Journal of Product Innovation Management, 27(5), 640-657. OECD (2000). Small and medium-sized enterprises: Local strength, global reach. Policy Brief. Ongori, H. (2008). Barriers to ICTs adoption in SMEs: Evidence from a developing country perspective. Prabandhan: Indian Journal of Management, 1(2), 12-17. Pirnea, I.C., & Caldararu, E.A. (2012). The relationship between performance and knowledge management in Romanian SMEs. Anale. Seria Stiinte Economice. Timisoara, 18, 512-517. Powell, W.W., & Snellman, K. (2004). The knowledge economy. Annual Review of Sociology, 30, 199-220. Qiang, C.Z.W., Clarke, G.R., & Halewood, N. (2006). Information and communications for development: Global trends and policies. Washington, DC: World Bank. Qiu Zhang, H., & Morrison, A. (2007). How can the small to medium sized travel agents stay competitive in China's travel service sector? International Journal of Contemporary Hospitality Management, 19(4), 275-285. Racol?a-Paina, N.D., & Burc?-Voicu, M.I. (2013). The competitiveness of SMEs in the EU member states: Challenges and lessons ahead for Romania. Babes-Bolyai University studies, EU, 58, 58(3). Rasula, J., Vuksic, V.B., & Stemberger, M.I. (2012). The impact of knowledge management on organisational performance. Economic and Business Review for Central and South-Eastern Europe, 14(2), 147. Rizea, I.C., Parpandel, D.E., C?ld?raru, A.E., & Radu, A.L. (2011). Current approaches regarding the knowledge management impact on SMEs performance. Economia Seria Management, 14(2), 564-567. Sabri, H. (2005). Knowledge management in its context: Adapting structure to a knowledge creating culture. International Journal of Commerce and Management, 15(2), 113-128. Saqib, M., Baluch, N.H., & Udin, Z.M. (2017). Moderating role of technology orientation on the relationship between knowledge management and smes' performance in Oman: A conceptual study. International Journal of Economic Perspectives, 11(1), 433-441. Saqib, M., Udin, Z.M., & Baluch, N. (2017). The Impact of Knowledge Management on Organizational Performance in Today’s Economy. South East Journal of Contemporary Business, Economics and Law, 12(3). Sekaran, U., & Bougie, R. (2016). Research methods for business: A skill building approach. Shackelford, A., & Sun, P.Y. (2009). Knowledge Management Strategy Employed in a SME. Journal of Knowledge Management Practice, 10(4). Shi, H., Peng, S.Z., Liu, Y., & Zhong, P. (2008). Barriers to the implementation of cleaner production in Chinese SMEs: government, industry and expert stakeholders' perspectives. Journal of Cleaner Production, 16(7), 842-852. Skyrme, D. (2012). Capitalizing on knowledge. Routledge. Sullivan Mort, G., Weerawardena, J., & Liesch, P. (2012). Advancing entrepreneurial marketing: Evidence from born global firms. European Journal of Marketing, 46(3/4), 542-561. Thorpe, R., Holt, R., Macpherson, A., & Pittaway, L. (2005). Using knowledge within small and medium?sized firms: a systematic review of the evidence. International Journal of Management Reviews, 7(4), 257-281. Urban, B., & Barreria, J. (2010). Empirical investigations into firm technology orientation and entrepreneurial orientation. International Journal of Innovation and Technology Management, 7(04), 329-351. Varum, C.A., & Rocha, V.C. (2012). The effect of crises on firm exit and the moderating effect of firm size. Economics Letters, 114(1), 94-97. Zack, M., McKeen, J., & Singh, S. (2009). Knowledge management and organizational performance: An exploratory analysis. Journal of Knowledge Management, 13(6), 392-409. Zaied, A.N.H., Hussein, G.S., & Hassan, M.M. (2012). The role of knowledge management in enhancing organizational performance. International Journal of Information Engineering and Electronic Business, 4(5), 27. Zhou, H., & Uhlaner, L.M. (2009). Knowledge management as a strategic tool to foster innovativeness of SMEs. Zhou, H., & Uhlaner, L.M. (2009). Knowledge management in the SME and its relationship to strategy, family orientation and organization learning.